Manuscript submitted April 22, 2011; resubmitted May 9, 2011; accepted May 10, 2011. Pancreas transplant recipients continue to suffer high surgical morbidity. Current robotic technology provides a unique opportunity to test whether laparoscopy can improve the post-operative course of pancreas transplantation (PT). Current knowledge on robotic pancreas and renal transplantation was reviewed to determine feasibility and safety of robotic PT. Information available from literature was included in this review, together with personal experience including three PT, and two renal allotransplants. As of April 2011, the relevant literature provides two case reports on robotic renal transplantation. The author’s experience consists of one further renal allotransplantation, two solitary PT, and one simultaneous pancreas-kidney transplantation. Information obtained at international conferences include several other renal allotransplants, but no additional PT. Preliminary data show that PT is feasible laparoscopically under robotic assistance, but raises concerns regarding the effects of increased warm ischemia time on graft viability. Indeed, during construction of vascular anastomoses, graft temperature progressively increases, since maintenance of a stable graft temperature is difficult to achieve laparoscopically. There is no proof that progressive graft warming produces actual damage to transplanted organs, unless exceedingly long. However, this important question is likely to elicit a vibrant discussion in the transplant community. Vascularized pancreas transplantation (PT) is the only treatment option that restores insulin-independence in beta-cell-penic diabetic patients , but euglycemia is achieved at the price of chronic immunosuppression [2, 3], and frequent post-transplant complications [1, 4]. 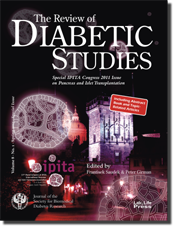 The consequences of surgical complications are aggravated by the intrinsic fragility of diabetic patients . These consequences make PT a high-risk operation. Therefore, a reduction in PT surgical morbidity would be very welcome. Laparoscopy has improved surgery results [6, 7]. However, optical and mechanical limitations of conventional laparoscopy constrict the use of this technique in transplant surgery . 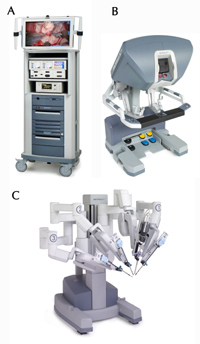 The enhanced operative abilities of robotic surgery using the da Vinci surgical system (dVss) have eliminated most of the technical barriers of conventional laparoscopy, and provide a unique opportunity to test whether laparoscopy can improve the post-operative course of PT. In this article, we reviewed current knowledge on robotic pancreas and renal transplantation, to determine feasibility and safety of robotic PT. In the specific sense of the term, the dVss is not a robot device. More generally, it is an electromechanical actuator, faithfully reproducing the movements of the surgeon’s hands at the tip of laparoscopic wrist instruments. The last generation of dVss is the da Vinci Si high definition (SiHD) surgical system. There are three previous dVss generations. Although all devices are based on the same technology, the newer system provides one additional instrument arm (three instead of two), further improves the high definition 3-dimensional view, and has a dual surgeon console. The dVss SiHD is composed of a vision chart, which houses a dual light source and dual 3-chip cameras, two surgeon consoles, and a moveable tower mounting three instrument arms and one camera arm (Figure 1). The optic contains two cameras generating a high definition three-dimensional image with actual perception of depth, and 10x to 15x magnification. The true three-dimensional view completely restores the hand-eye coordination, which is lost in conventional laparoscopy due to the bi-planar image . Furthermore, the view is steady and the camera is driven directly by the operating surgeon. Figure 1. The da Vinci surgical system Si high definition for robot-assisted surgery. A: Vision chart. B: Surgeon console. C: Tower. The surgeon console consists of a view port where the surgeon can see the operative field, foot pedals to control several energy devices, camera focus, instrument/camera clutches, and master control grips that faithfully reproduce the movements of surgeon's hands at the tip of laparoscopic wrist instruments. These instruments have seven degrees of freedom, very much alike the human wrist, and behave as miniaturized extensions of surgeon's hands moving with microscopic precision within the patient’s body. Importantly, the dVss can scale surgeon movements, so that large movements are transformed into micromotions inside the patient. Furthermore, the system tracks surgeon’s movements 1,300 times per second, eliminating human tremor. High cost and lack of haptic feedback are the greatest limitations of current dVss. Other main drawbacks are risk of technical failure, loss of direct contact between surgeon and patient, and poor adaptability to multi-quadrant surgery . A literature search on PubMed (http://www. ncbi.nlm.nih.gov/pubmed/) showed that there is no published report on PT using robotic surgical systems. Thus, the experiences reported here are the first published accounts worldwide. Our decision to pursue robotic PT was based on the hypothesis that a minimally invasive operation could reduce the rate of surgical complications. Also, we aimed to provide evidence that this complex operation can be successfully performed laparoscopically using the dVss SiHD. Before embarking upon robotic PT, we had performed over 1,600 conventional renal allotransplants, over 300 conventional PT, thousands of laparoscopic operations, and over 150 robotic operations including renal allotransplantation , renal autotransplantation, resection of visceral artery aneurysms, pyeloplasty, partial nephrectomy, pancreaticoduodenectomy, major hepatectomies, and other abdominal operations. Due to this extensive background experience, we felt confident that we could construct vascular anastomoses safely and quickly enough to avoid compromised graft viability. Our major concerns were the possibility of uncontrollable bleeding at the time of reperfusion, the occurrence of technical problems delaying graft revascularization, and the effects of pneumoperitoneum on the freshly revascularized graft. A further problem, in the simultaneous pancreas-kidney transplant was the need for dual organ transplantation. In contrast to our usual policy of quick en-bloc procurement of abdominal organs , pancreas grafts were fully dissected in situ before aortic crossclamping. All vascular pedicles were dissected out, but they were not ligated, or divided, until completion of visceral perfusion. Abdominal grafts were perfused through an aortic cannula with University of Wisconsin solution (70 ml/kg) by gravity flush. Direct portal perfusion of the liver was added at the back-table, if required by the liver team. At the back-table, pancreas vasculature was reconstructed using a donor Y iliac graft using standard techniques. Hence, the two anastomoses required in this reconstruction were the only two sites in which hemostasis was not verified in vivo in the donor. Suture lines were tested at the back-table. We decided to modify the technique of graft implantation that we have previously described for conventional PT with portal-enteric drainage. The advantages of this modification were that we had the pancreas in a fixed position, and we had access to large recipient vessels . As with the original technique, the pancreas was placed behind the right colon, above the psoas muscle; but the proximal vena cava was preferred to the superior mesenteric vein for the venous anastomosis, due to larger caliber and easier handling. Furthermore, we performed one small incision along the midline to insert the graft into the abdomen, just above the umbelicus. This working incision allowed manual application of bulldog clamps, and would have allowed quick conversion through the optimal midline route, providing full control of the entire abdominal cavity in case of massive bleeding and/or technical difficulties. Experience gained with laparoscopic live donor nephrectomy shows that prolonged CO2 pneumoperitoneum reduces the blood supply to intrabdominal organs . Thus, besides setting pneumoperitoneum pressure at a maximum of 12 mmHg, we decided to use the small working incision performed along the midline to construct the duodeno-jejunal anastomosis manually. We preferred to use a Roux-en-Y loop according to our standard policy . Placing the two grafts on the right side , the pancreas in a more cephalad position and the kidney in a more caudad position, allowed us to transplant both grafts without modifying patient position, or inserting additional ports. As robotic construction of uretero-vesical anastomosis would have required repositioning of the patient and the robotic tower, we decided to perform it manually, after converting the suprapubic robotic port access to a mini-incision, measuring approximately 3 cm. In summary, patients were placed supine on the operating table with the right flank slightly elevated. After securing them with wide banding, the table was put in 10 degrees Trendelenburg position and tilted some 25 degrees to the left. A 7 cm incision was performed along the midline just above the umbilicus and a hand access device was inserted (GelPort, Applied Medical, Rancho Santa Margarita, CA, USA). Two 8 mm robotic ports were placed along the right pararectal line some 5 cm below the costal margin and 3 cm above the pubis, respectively. The optic port (11 mm) was placed slightly to the left of the midline, a few centimeters below the navel (Figure 2). After docking the dVss, the operation began by mobilizing the right colon, and exposing the proximal segment of the inferior vena cava and the common iliac artery. Vascular anastomoses were performed, both end-to-side, using fine sutures of expanded polytetrafluoroethylene (ePTFE). Donor portal vein was anastomosed to recipient vena cava, and donor Y iliac graft to recipient common iliac artery. As mentioned earlier, exocrine drainage was achieved through a Roux-en-Y jejunal loop. Figure 2. Trocar and hand-assist device placement. AP: Assistant port. OP: Optic port. RP: Robotic port. A literature search on PubMed (http://www. ncbi.nlm.nih.gov/pubmed/) disclosed three case report publications describing human robotic renal allotransplantation [11, 16, 17], and one on an experimental model for ex-vivo training . 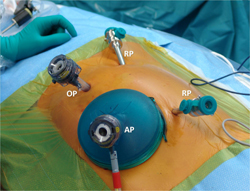 The first case report actually describes a hybrid method involving open exposure of iliac vessels and robotic vascular anastomosis . The first actual robotic renal transplantation was reported by Giulianotti et al. in 2010 , although the first human operation had been carried out by Geffner at the Saint Barnabas Medical Center (New Jersey, USA) in January 2009 (unpublished data). Early this year, we published the first European case of robotic renal transplantation . Based on information obtained at the 5th International Conference "Living donor abdominal organ transplantation: state of the art." (June 25-26, 2010; Florence, Italy), as of June 2010, 25 robotic renal transplants had been performed in the USA . The techniques used by Geffner , Giuliannotti , and ourselves  differ in both the site of kidney placement and the location of the working incision used to insert the graft. Geffner carried out a small iliac incision along the line that would be used in case of conventional transplantation, and created an underneath retroperitoneal pocket where the kidney was eventually placed . Giulianotti et al. preferred to use a hand-assisted technique by making the incision along the midline, in the periumbilical area. The graft was placed intraperitoneally . We preferred to use a small transverse suprapubic incision, which can also be employed for the uretero-vesical anastomosis. The kidney was eventually retroperitonealized behind the cecum . Our pancreas grafts were transplanted after a mean cold ischemia time of 7 h and 20 min. Operative time was 3 h and 5 h, respectively, for the two solitary pancreas transplantations and 8 h for the simultaneous pancreas-kidney transplantation. Mean warm ischemia time was 30 min. Grafts reperfused well. Only the last graft required direct intervention to stop bleeding from vessels at the mesenteric root, and at the back of the pancreatic head. Blood loss was modest in all three recipients. Insulin-independence was soon achieved in all recipients. No complication occurred in the post-operative course. The scarce information obtained from the literature [11, 17] showed that anastomotic time of the first two operations performed in the USA, and Europe, was around 50 min. Our subsequent experience on two additional renal allotransplants, including the kidney transplanted simultaneously with the pancreas, showed that anastomotic time quickly improves, achieving the same 30 min time, as required in PT. The ex-vivo model of training confirmed that anastomotic time was quickly reduced . The two transplants reported in the literature functioned immediately and promptly [11, 17]. Also, our two further patients enjoyed immediate graft function. No post-operative complication was reported [11, 17], and we have observed none in our two additional cases. Despite the potentially unlimited pool of candidate recipients , PT continues to be offered only to highly selected patients who have poor quality of life under conventional medical therapies. If immunosuppression could be avoided, or minimized, and surgical complications greatly reduced, a larger proportion of diabetics could be offered the option of vascularized PT. While graft tolerance, without continuous pharmacologic intervention, remains the holy grail of transplant medicine, reduction of surgical morbidity may represent a better objective. Indeed, islet transplantation continues to be pursued mostly due to lower morbidity, despite the as yet unsatisfactory results, and the need of robust immunosuppression . Laparoscopy has been established in many operations, ranging from the "simple" cholecystectomy to pancreatoduodenectomy . Laparoscopy decreases post-operative pain, and results in shorter hospital stay, quicker return to daily activities, better cosmesis, and improved postoperative immune function. Despite all these advantages, the use of laparoscopy in operations requiring fine intracorporeal suturing and/or multiple anastomosis is not straightforward due to the technical and mechanical limitations of current equipment. Indeed, the long laparoscopic instruments amplify natural surgeon's tremor, carry a fulcrum effect, have restricted degrees of motion, and limited tactile and force feedback. The bidimensional view, even if sometimes highly defined, causes the loss of the natural hand-eye coordination reducing surgeon dexterity. This may be further worsened by poor ergonomy leading to surgeon fatigue, especially in long-lasting operations . The intrinsic limitations of conventional laparoscopy may all be overcome by an exceptionally skilled surgeon, especially if he, or she, works under optimal operative conditions and on the ideal patient, which makes laparoscopic renal transplantation technically possible . However, the extraordinary technology improvements of the dVss pave the way for even more surgeons to safely transplant abdominal organs. 1. Availability of real 3-dimensional view, including 10x to 15x magnification, which completely restores the hand-eye coordination. The view is steady, and the camera is driven by the operating surgeon. 2. Use of instruments with a distal articulation, similar to human wrist (Endowrist®). This allows seven degrees of freedom, and exactly reproduces the movements of surgeon's hands. Endowrist instruments totally avoid the fulcrum effect seen in conventional laparoscopy. 3. Furthermore, the device tracks surgeon's movements 1,300 times per second. This eliminates human tremor, and provides the option of motion scaling, thus transforming larger movements of the control grips into micromotions at the tip of endowrist instruments. The main limitations of current dVss are lack of haptic feedback, high cost, risk of technical failure, poor adaptability to multiquadrant surgery, and loss of direct contact between surgeon and patient . Lack of haptic feedback is partially compensated by the extraordinary view offered by the dVss , but involves a learning curve for both tissue manipulation and handling of sutures. A newer surgical robot (Amadeus® Robotic Surgical System, Titan Medical Inc., Toronto, Ontario, Canada), which is not yet available on the market, should provide tactile feedback and hopefully solve these problems. Until newer devices with force perception are available, some precautions should be adopted while constructing vascular anastomosis using current robotic technology. Experimental studies have shown that repetitive needle driver manipulations weaken suture materials. ePTFE is weakened less than polypropylene [22, 23], and should therefore be preferred for robotic vascular anastomosis. Furthermore, large needle drivers, that have rough gripping surfaces, cause more suture damage than micro-needle drivers, that have smooth gripping surfaces. Initial experiences in the USA , and in Europe , have shown that renal transplantation is feasible using robot-assisted laparosocopy. Our robotic PT is one of the first ever performed, and it shows that PT is feasible laparoscopically using robotic assistance. However, safety and advantages of these newer approaches remain to be determined. Our decision to pursue this new surgical strategy was based on several considerations. Firstly, since the dVss works efficiently within narrow spaces, vascular anastomosis can be constructed with minimal vessel exposure. This may be of benefit in patients with limited vascular access, whilst at the same time, the incidence and severity of perigraft fluid collection could be reduced. Furthermore, limited tissue handling could reduce the activation of coagulation cascade . Hopefully, this contributes to a decrease the typical propensity of pancreas allograft to thrombosis. Secondly, laparoscopic surgery reduces proinflammatory response , and results in lower immune suppression . Although PT recipients receive vigorous immunosuppression, sparing some of the paths of innate immunity should be beneficial, especially in diabetics whose post-transplant course is typically plagued by infection. Thirdly, the duration of paralytic ileus could be reduced, since the intestine is manipulated less than in conventional surgery. Though large vascular anastomoses required in PT can easily be constructed using the dVss, the graft cannot be cooled during operation. The effects of this progressive graft rewarming are not known. We have shown that venous and arterial anastomoses can be constructed in some 30 minutes. When PT is performed using grafts procured from non-heart beating donors, warm ischemic times up to 45 minutes do not jeopardize graft function . Longer anastomotic times, however, could expose the pancreas graft to temperature injury resulting in graft failure or surgical complications. Therefore, development of a pancreas jacket, allowing intracorporeal graft cooling, would be very useful. This kind of device has already been developed for the kidney [27-29], but it is not user-friendly due to the exposure and space limitations typically faced in laparoscopy. Topical graft cooling would require continuous suction, possibly leading to pneumoperitoneum collapse and fogging of the lens. dVss allows safer control of bleeding than non-robotic laparoscopy, since endowrist instruments may be articulated and locked into a fixed position, acting as true "Satinski" clamps, and sutures can be thrown with the same dexterity as in open surgery . However, massive bleeding requires frequent suction, leading to pneumoperitoneum collapse, while multiple bleeding sites may be tedious to control laparosocpically. Our philosophy is to do our best in the donor and at the back table to limit the chance of intraoperative graft bleeding, and to have a low threshold to conversion. In conclusion, we believe that our experience with PT, and the previous experiences with renal transplantation, show that these organs can be transplanted laparoscopically. Further experience is needed to define whether the minimally invasive approach will convey real benefits to recipients. It is likely that this new technique will motivate researchers to obtain more insight into the effect of progressive graft rewarming and/or to develop user-friendly cooling jackets. From a technical point of view, the liver could be transplanted laparoscopically under robotic assistance too, although the need of hepatectomy of native liver, on the background of chronic hepatic disease, poses new and specific challenges. Disclosures (conflict of interests statement): The authors report no conflict of interests.